Donald Trump was in Florida yesterday trying to convince people that the tax cuts passed by Congress and signed by him were actually good for all Americans. They aren't. Almost all of the benefits from that tax plan go to the rich. Corporations were supposed to use their cuts to create jobs and raise wages. They aren't. They are instead driving up the price of their stock by buying large amounts of it. 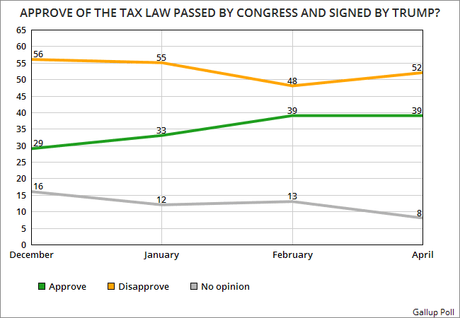 Fortunately, the public knows that this was a bad tax plan that only benefitted the rich -- and a majority (52%) still disapprove of the plan. In fact, the public disapproves more than approves by 13 points. Unless that changes (and it doesn't look like it will), the plan will not help Republicans in the 2018 election (as they had hoped it would). The chart above uses information from the Gallup Poll. The latest poll was done between April 2nd and 11th of a random national sample of 1,015 adults, with a 4 point margin of error.